What are Product Variants and How Do I Set Them Up? – How can we help? 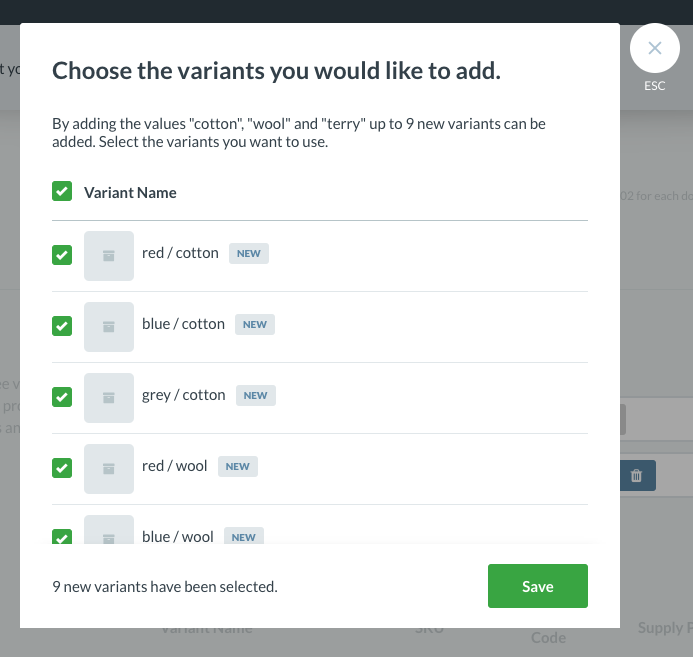 Update: Vend has the functionality to allow you to add variants to your products. To learn more on how to add variants to your products, follow the steps below. 1. Select Products and click the Add Product button. 2. You will then need to create a master (parent) product. The parent product is the primary product you intend to create variants of. The parent product will also be the first variant. You will want to fill out all the standard information you would for a regular product including name, handle, tag and product type. You will then want to scroll down to the Inventory section; here you will find an option to turn the product into a Product with Variants. Click on this option. It is highly recommended that you add in the correct supply price before stocking this product so that your costs of goods sold are accurately tracked. This will automatically be your default sales tax. However, you can use the drop-down in the Tax section to specify which tax types to apply to this product. Enter the final retail price for this product. The Supply price, markup and tax will be applied automatically. If you use Vend loyalty in your store, you can choose to enable it for this product, as in the image below. Your Attributes are the different features of your product and may include size, colour or style. You can add one, two or three attributes to your product. You will need to add values for each of these attributes and these may be the various colours, sizes or styles that your product has. To add values, begin typing them into the value field next to each corresponding attribute, and click Return/Enter. Important: Your product cannot have more than 200 variants. If you think you will need more than three variants (attributes) for a product, you may want to split this product. Click on Add another attribute to add another attribute to your variants. Add values to this attribute and click on Add X values. A modal will display giving you the option to Choose the variants you would like to add. Here is where you can select and unselect the variants you want to add to your store. Now that you have a list of your variants, you can click to expand them and make a range of product-specific edits. Add how much inventory you have for the product, alongside the Reorder point and Reorder Amount. The reorder point is the quantity at which this variant product will be auto-filled the next time you create a stock order containing the product. The reorder amount is the default amount that you will order when your product hits its reorder point. 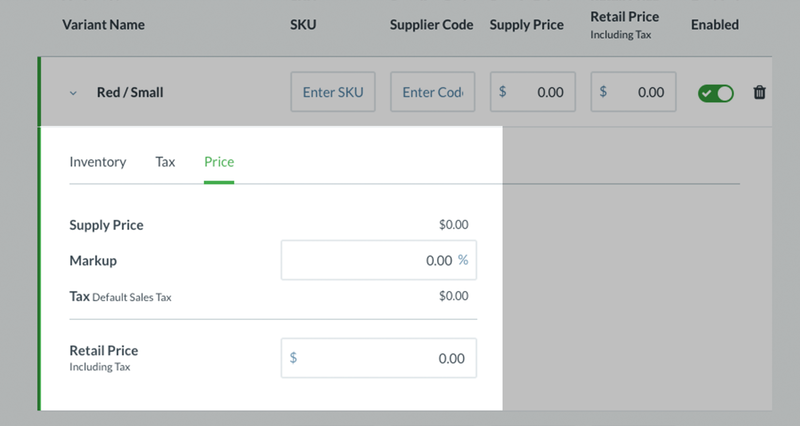 While it is important to add inventory to these products using Vend's stock order function, you can choose to add your reorder points and reorder amounts from this product edit page. To do this, click on the variant product you would like to edit, select the inventory tab and input your desired reorder point and reorder amount. Once you have set a reorder point for a product, when the product's inventory is lower than the set reorder point, the product will automatically be ordered (to the value of your reorder count) when you next create a stock order involving this product. If this product already exists in another open or sent stock order for the same outlet it will not automatically be added to a stock order. The reorder amount you set will be the amount of stock that is added to the product's current stock after it drops below its reorder point, not the new total stock amount. If you need to specify different tax rates for some of your variant products, click the Taxes tab and change the values as required. Each variant product will assume the supply price, markup and retail price of the main parent product. You can adjust this on a per variant basis by clicking the variant you would like to edit and changing the desired Price fields. 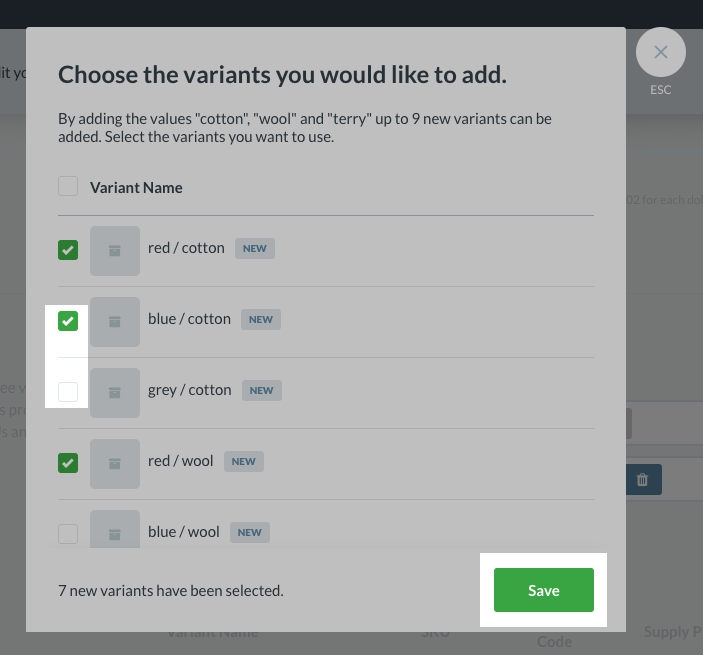 Important: If you are adding variants to an existing product, you will be required to select how you want your SKUs to be added to the new variants. Either Automatically Generating a SKU or by Entering a Custom SKU. We recommend choosing the same option you chose when adding your variants in the first instance. For more information on how to add variants to an existing product, check out this article. Note: Every 'variation' (i.e., 'small brown', 'medium brown', 'small blue', 'medium blue') has a unique stock keeping record (SKU) and inventory value. If you have selected to Enter a custom SKU you will have to change the SKU code for the product manually. 1. Navigate to the Inventory section, and select Enter a custom SKU. 2. Once this is done, you can enter the custom SKU's of your variant products in the Variants field. Note: the SKU field is not case sensitive so you can use upper or lower case characters. Once you have created all the product variants, you will need to add some stock. To learn how to do this, check out this article here. Finally, confirm that everything looks correct and click Save at the top of the page to save the product, and its variants.